Austin Playhouse is excited to present Lucky Stiff by Lynn Ahrens and Stephen Flaherty, the Tony Award-winning team that wrote Ragtime and Once On This Island! This hilarious, fast-paced murder-mystery tells the story of Harry, an unassuming English shoe salesman who thinks his luck has finally changed when he inherits $6 million from an unknown American uncle. Unfortunately, there's a catch. Harry must take a vacation to Monte Carlo with his uncle’s embalmed body and convince folks he’s still alive. Otherwise, the money goes to the Universal Dog Home of Brooklyn... or Uncle Tony’s gun-toting ex! Filled with colorful characters, a witty book, and toe-tapping songs, this farcical musical will have audiences dying with laughter. 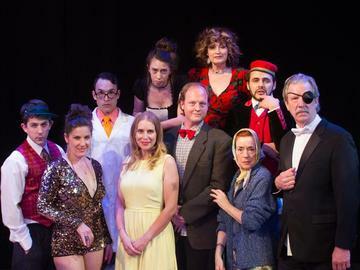 Lucky Stiff will be produced in Austin Playhouse's theatre at ACC's Highland campus. Beginning June 9, the South lot will be closed and the North entrance to ACC Highland will be open. From Airport Blvd, you'll enter the ACC lot from Highland Mall Blvd and turn right on Jonathan Drive. Park in the East ACC parking lot and enter the North entrance, which is labeled Building 4000. Once you enter the building, proceed down the escalator, elevator or stairs and follow the signs. Austin Playhouse will be on your right by the water feature. Click here to see a helpful map!